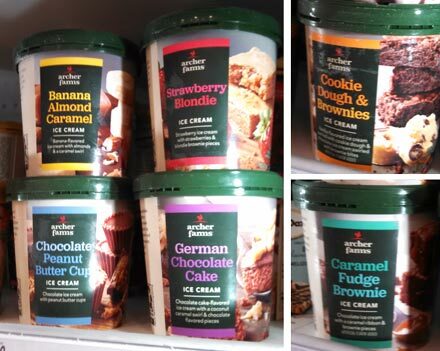 On Second Scoop: Ice Cream Reviews: New Archer Farms Gelato and Ice Cream lineup at Target. I try the one with Cookie Dough in it. 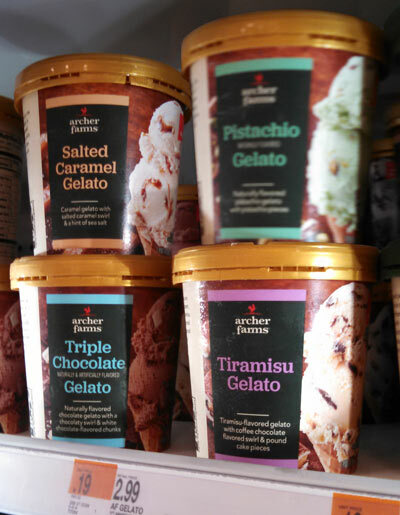 New Archer Farms Gelato and Ice Cream lineup at Target. I try the one with Cookie Dough in it. Last week, a couple of fellow ice cream enthusiasts let us know that there were some gelato and ice cream changes going on over at Target. 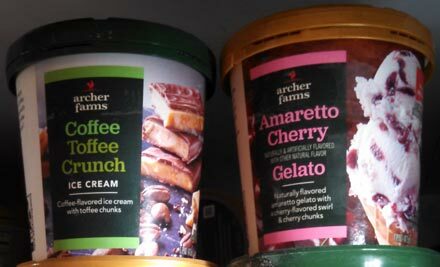 Apparently their gelato has changed format again plus their in house Archer Farms name is back in pint size form. Nick and I were both intrigued and I finally got a chance to hit Target at lunch today and make a nice mess of their shelves to get you guys a bunch of pictures... I hope my Target doesn't mind. Oh, I also picked up one of the ice cream pints, so that review will be after the pictures. Three shelves worth of choices... where to start? 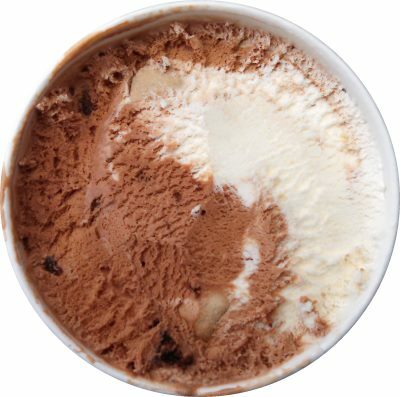 All natural Simply Balanced Ice Cream Pints. 7 flavors and the pint I checked had 7 ingredients. We've got vanilla bean, chocolate, strawberry ice cream with strawberry pieces, coffee, butter pecan, cinnamon (review here), and chocolate chunk (chocolate ice cream with chocolate flavored pieces). That's an interesting choice to make your basic flavors all natural, and leave the fancy stuff for the other pints. Well played Target. Archer Farms Ice Cream Pints. There are at least seven eight flavors. I remove the neat lid seal and realize that the pint in my hand weighs almost nothing. Whoa, yeah, that sure looks like light ice cream! The Parking Lot Scoop: I take my first bite and am.... underwhelmed. Back when they tagged their larger ice cream containers with the Archer Farms logo, it was a fairly heavy product, but now, whoa is this light. I kind of feel like I'm eating a giant hoodsie cup. At least this hoodsie cup has giant brownies and cookie dough balls. The most important thing I want to stress right now is that for $2.99, I'm pretty sure I could destroy this pint in a single sitting. There is zero resistance going on here. It's just chomp scoop chomp scoop chomp scoop. For the most part there is a brownie (in chocolate) or cookie dough (in vanilla) in every bite, but I just wasn't filling up at all. It's so light that I had trouble going slow, I just wanted to dig for treasure. Speaking of treasure, it makes a decent first impression. The plentiful brownies are actually fairly light, borderline cakey and not some heavy, dense thing. The cookie dough is large and has a good amount of flavor to it. That said, both felt off to me in some way. Nothing I could nail down during the inhaling, but I will have to elaborate later this afternoon.... cause I'm still hungry! The Afternoon Scoop: Ice cream time! I'm headed right for the brownie bits... I want to say there is an unexpected complexity to them unless that's the base chocolate messing with me. Hmmm, maybe it is the base. There's a... iunno, something off to it. Let's switch to the vanilla. It's ok, nothing remarkable. Cookie Dough bites aren't bad, aren't awesome. The problem is that the chocolate/brownie side is lingering on my taste buds. And again I've eaten too quickly. All I can think about is a giant hoodsie cup, and that's not necessarily a compliment. I wanted this to be a high end surprise, but it's just a budget snack. Yeah, really not digging the lingering chocolate aftertaste. I left some tomorrow to see if I change my opinion, but at this point, I say meh. Is Archer Farms the Target store brand or a regional brand? You should give the Edy's Slow Churned Cookie Dough a try. You will not be disappointed! 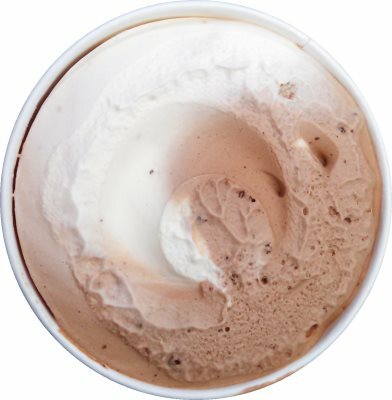 I just tasted it yesterday, and it's been my clear favorite from Edy's! yeah, it's fine, but I tend to grab blue bunny's version actually, or turkey hill if i can find it, or friendlys as a backup. is it just me, or is mainstream cookie dough hard to find nowadays? I have to go hunting around to see which brand has it in stock at whatever store I am at. I will have to look for the pistachio flavor, love Talenti's pistachio! But what the *bleep* is a white chocolate flavored chunk int he Triple Chocolate? @firstperson: yup, archer farms is in house, tweaked the review to make that more clear. @Sophia: yup, a few companies have pulled the white chocolate card when making a triple chocolate flavor. They discontinued Cake and Sprinkles!! A travesty if there ever was one. @Anon: did you ask or have you just not seen it in awhile? It still shows on their website. One of the new Market Pantry quart size ice cream tubs from Target is called Cookie Spread and it is really good. It tastes just like TH Pumpkin Pie but switching out the pumpkin ice cream for caramel cinnamon ice cream. The cinnamon graham swirl tastes just the same and its awesome for a graham swirl lover like me. Does Target still have the Mini Donut ice cream? I'll have to eventually get their Cookie Spread ice cream since I love cinnamon ice creams. 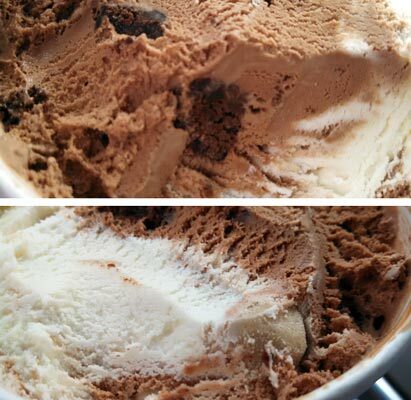 The original triple chocolate was the best ice cream I have ever had. I hope the gelato is just as good. 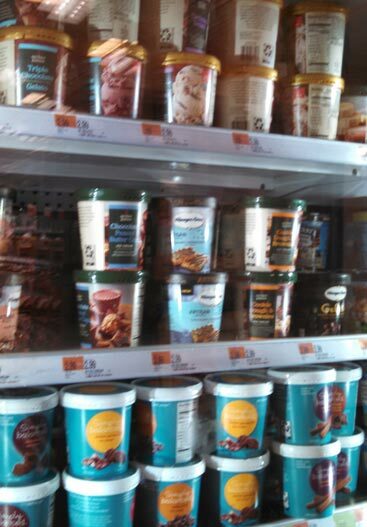 I am a die hard German Chocolate ice cream fan, love 31 Flavors, but it is seasonal there. 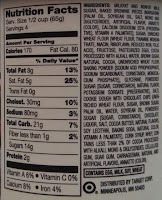 Also Thrifty brand, has a killer German Chocolate, even slightly better than 31 flavors. So I was a little nervous about this brand. Well it hit the mark, if you are a fan of GCKIC, try this brand, and it is the perfect size to have a little nibble here or there. Got the Amaretto Cherry and Pistachio for $2.50. Tried the Amaretto last night. The actual flavor wasn't too bad, but the "mouthfeel" was more like whipped, frozen lard. It left a very unpleasant coating on the mouth and tongue. I'm back to Haagen-Daz, B&J's and Talenti, all excellent especially Talenti's Pistachio and Hazelnut. Life is too short to eat bad ice cream at any price. I agree, light fluffy, bad mouth feel. 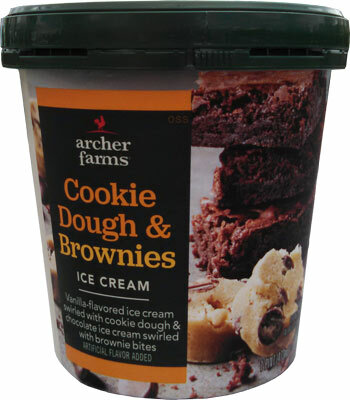 Very disappointing because I remember the old Archer Farms in the large containers that you were talking about, and those ice creams were phenomenal. 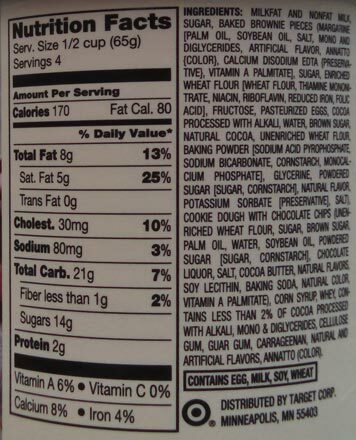 Remember when their dutch chocolate was rated by Consumer Reports as above Ben & Jerry's, and Haagan-Dazs! The peanut butter was amazing. This brand of ice cream is seriously underwhelming and disappointing. Never again will I purchase this brand. I'd rather spend the extra money and just get the best. This ice cream has been consistently good. An earlier poster mentioned cake and sprinkles being discontinued, but it is still there just with a different name - Birthday Cake. It's the exact same recipe. Also, the best ice cream I have ever had is Cookie Spread. I've always been a fan of cinnamon ice cream, and this flavor is like cinnamon on steroids. The graham cracker cinnamon swirl is absolutely killer. I hope this flavor never goes away.